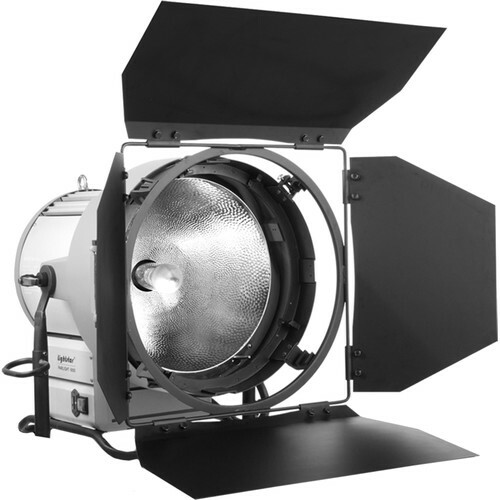 Designed for professional performance both in the studio and out on the field, the Lightstar 6000/9000W PAR HMI Head from ikan is an efficient daylight-balanced 5600K LED light paired with a 16.5" lens. It is constructed with a durable aluminum alloy housing which is rated to IP 23 weather resistance standards, protecting it against spraying water for safer use in the outdoors. Equipped with a spot-to-flood focusing knob, the beam angle of the light can be regulated between 15° and 56° to allow for better control over your lighting. Barndoors and are included with the product, which add the opportunity for selective lighting and a gel holder and a yoke with a 1-1/8" Junior pin also come in the package. However, the light requires a compatible ballast such as the ikan LEB-015 for powering, which needs to be purchased separately.